The pituitary gland lies in the hypophyseal fossa of the sphenoid and is connected to the hypothalamus by the infundibulum, or pituitary stalk. The dura covering the superior aspect of the gland forms the diaphragma sella. The gland is about 12mm transversely and 8mm in anteroposterior diameter. The major divisions of the gland are the anterior lobe or adenohypophysis, and the posterior lobe, the neurohypophysis. Each of these major subdivisions, which have different embryological origins are further subdivided. The pituitary gland is derived from two sources. The anterior lobe is an upgrowth of ectoderm from the roof of the stodeum, while the posterior lobe is a down growth of neurectoderm from the diencephalon. In the middle of the fourth week, a diverticulum, Rathke’s pouch, grows upwards from the roof of what will become the mouth towards the developing brain. As the upgrowth contacts a down growth from the brain, the infundibulum, it begins to pinch off from its connection with the stomodeum. By the sixth week the connection between Rathke’s pouch and the oral cavity degenerates. The cells of Rathke’s pouch proliferate to form the pars distalis, and extend up the anterior aspect of the infundibulum as the pars tuberallis. The posterior surface of Rathke’s pouch does not proliferate but forms the poorly developed pars intermedia. The infundibulum having grown down from the floor of the diencephalon, expands as the axons of cells in the diencephalon grow down into it. The arteries of the pituitary gland arise from the internal carotid arteries as the inferior and superior hypophyseal arteries. The inferior hypophyseal arteries mainly supply the pars nervosa before forming short portal vessels to supply the pars distalis. The superior hypophyseal arteries supply the floor of the hypothalamus, the median eminence. The capillary plexus formed by the superior hypophyseal artery in the median eminence form into long portal vessels which run down in the pituitary stalk to form a capillary plexus in the pars distalis. In the median eminence the capillary plexus receives secretions from releasing factor cells. The blood is drained from the pituitary by inferior hypophyseal veins into the dural venous sinuses. The anterior pituitary is formed of a range of cells producing several hormones. An essential component in the organization and function of the anterior pituitary is the close relationship between the cells and the capillary bed. The access to the circulation promotes uptake of the substrate for hormone synthesis and allows efficient release of hormones into the systemic circulation. The activity of the cells of the anterior pituitary is controlled through the presence of releasing factors present in the capillary blood. The releasing factors are formed by hypothalamic cells and released into the hypophyseal portal circulation. There are five distinct types of endocrine cell, distributed either throughout the pars distalis or localized to particular parts. Somatotrophs are found mainly in the lateral extensions of the lobe, secreting growth hormone. Corticotrophs are found mainly in the centre of the lobe, secreting adrenocoticotrophic hormone, beta-lipotrophin, alpha-melanocyte stimulating hormone and beta-endorphin. Thyrotrophs are concentrated mainly in the anterior of the lobe, secreting thyroid stimulating hormone. Lactotrophs, scattered throughout the lobe, secreting prolactin. Gonadotrophs, also scattered throughout the lobe, secreting follicle stimulating hormone and luteinizing hormone. These cells can be identified by various means. Early histological methods were based on the affinity for acidic and basic dyes. This resulted in cells being described as acidiphils, basophils or chromophobes which did not take up dye. Modern methods of identification are based on immunohistochemical identification of hormones and by the ultrastructural appearance of the cells. Control of the hormone producing cells of the pars distalis is through secretion by cells of the hypothalamus. Growth hormone releasing hormone (GHRH) is produced by cells of the arcuate nuclei. Growth hormone inhibiting hormone (somatostatin) is produced by the paraventricular nuclei. Corticotropin releasing hormone (CRH) is released from cells of the anterior part of the paraventricular nuclei. Thyrotropin releasing hormone (TRH) is produced by cells of the dorsomedial nuclei. 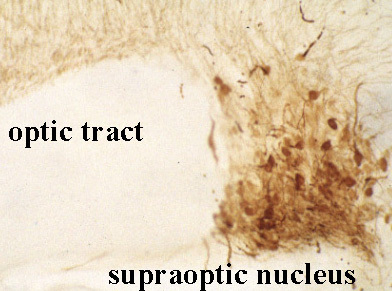 Prolactin release inhibiting hormone (dopamine) controlling the lactotrophs is produced by the cells of the arcuate nuclei. Gonadotropin releasing hormone (GnRH) is produced mainly by the cells of the arcuate nuclei and preoptic area. The pars intermedia is not well developed and it is thought that its cells produce pre-pro-opiomelanocortic peptides. The pars tuberalis is formed mainly of gonadotrophs. The posterior lobe or neurohypophysis is a continuation from the hypothalamus. The hormone producing cells are located in the supraoptic and paraventricular nuclei of the hypothalamus. The axons of these neurons run down the pituitary stalk to terminate on the capillary bed of the posterior lobe. The terminals are separated and grouped by glial cells, the pituicytes. The axons of the hormone producing cells can be seen to contain numerous small clear vesicles, and larger dense core vesicles. Upward growth of pituitary tumours may press on the optic chiasma. Typical visual field defects would be bitemporal hemianopia, and upper quadrantopia. Tumours can grow up into the third ventricle causing hydrocephalus. Rapid lateral expansion, perhaps due to haemorrhage may compress the third, fourth or sixth cranial nerves. Headache may be present from stretch of the meninges. Surgery to remove pituitary tumours is usually performed through the sphenoidal sinus. Memorial University of Newfoundland – Unfortunately these pages seem to have expired.